Google maps and Mapquest are wrong the Harbor Pub fronts the Marina at the corner of Holomaona Street and Hobron Lane. Prime location fronting the Ala Wai Boat Harbor. The Harbor Pub is tucked beneath the Chart House at the corner of Hobron Lane and Holomoana Street. The correct location is indicated below with a red "X" on the map below. WE HAVE CONTACTED GOOGLE MAPS TO INFORM THEM THAT OUR LOCATION IS NOT CORRECTLY INDICATED. PLEASE BE PATIENT WHILE THEY WORK TO CORRECT THE ERROR. The Entertainment Guide map location is also slighly off. 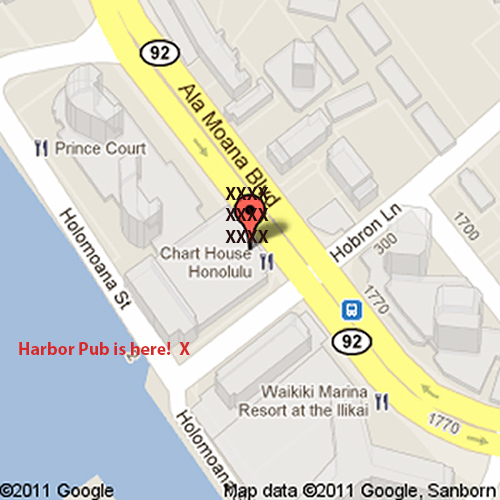 Use the location indicated below or the Prince Hotel Waikiki we are in the building next door facing Makai (the ocean). If you want to use mapping software for directions use the Prince Hotel Waikiki, 110 Holomoana Street. 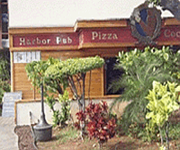 The Harbor Pub is on the street level at the corner of Hobron and Holomoana Street.